For some being balanced is an important thing to strive for, for others it isn’t really at the top of their list. Some people actually prefer the intensity of being unbalanced, while others enjoy a sense of harmony in their lives. 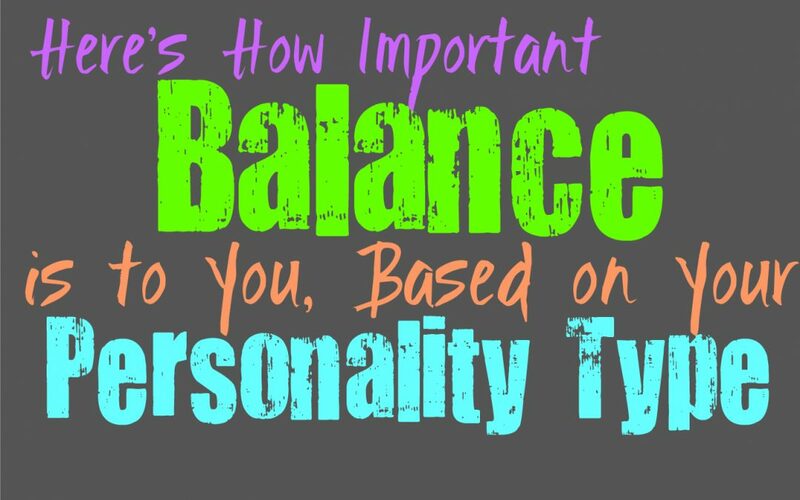 Here is how important balance is to you, based on your personality type. INFJs do believe in obtaining some sort of balance in their lives, and will experience peace with it. They want to keep a sense of harmony where they can, but they aren’t afraid of breaking it if it is necessary. For the INFJ it is about knowing when to adjust and how to always follow a path that is right. For the INFJ going to drastically one way often seems reckless and foolish, which is why they do value balance where they can achieve it. They also know that constantly trying to protect this balance does the opposite, so they will step out of their comfort zone when it they must. ENFJs do believe in maintaining a sense of balance, mostly because they work hard to juggle so many things at once. For them it is important to keep balance in their lives, so that they can manage their responsibilities properly. Their loved ones are important to the ENFJ, so they want to make sure they take care of their needs. For the ENFJ balance is simply an important thing to maintain in their lives, so that they can ensure everything is taken care of without having things fall apart for them. INFPs do enjoy having balance in their lives to some extent, and will like having a sense of peace. There are times though when the INFP becomes so passionate about something that it becomes a bit of an obsession. This obsessive side definitely makes it challenging to maintain balance, since the INFP wants to immerse themselves in this hobby, subject or person completely. They don’t like doing things halfway, and this can make it very difficult for them to keep a sense of balance. ENFPs aren’t often great at maintaining a sense of balance, simply because they never do something in a subtle way. When the ENFP becomes truly passionate and excited about something, they go all out. They don’t do things halfway and will put themselves into it with all they have. This makes it difficult for the ENFP to live their lives with balance, since they often go rather far one way with things. They can become especially passionate when they feel connected to something, and would rather immerse themselves in it completely. INTJs definitely do believe in maintaining some sort of balance in their lives, since this helps them become more objective. Constantly being dramatically one direction about things, is not the way to truly make a clear decision. They will research and observe all of their options, wanting to understand the information at hand. INTJs are often collected individuals when it comes to making choices in life, and because of this they strive to maintain balance where they can. For them this balance simply means approaching everything from an open perspective, but not so open that they aren’t capable of being discerning. ENTJs believe that balance is good in some situations, but there intensity can make this challenging. They go after what they want with a sense of focus and directness, and sometimes this might appear over the top. ENTJs simply don’t believe in holding back, and have a somewhat aggressive nature when it comes to achieving their goals. They don’t want to allow anything to stand in the way, even themselves. When it comes to living their lives, ENTJs might not always value balance in their actions. While INTPs might believe in the importance of balance, it isn’t always easy for them to achieve it. They sometimes need to obtain this sense of balance through plenty of research and exposure to the extremes. INTPs simply want to learn as much as they can, and will constantly want to dive into something with a bit of intensity. This can cause the INTP to immerse themselves in a subject, which can appear more obsessive than it does balanced. This is simply so that the INTP can come to a final conclusion, which will ultimately create more balance in their lives. ENTPs definitely have a hard time living balanced lives, but this doesn’t often bother them. They prefer to live with intensity and passion, and enjoy seeking out the things that can challenge them. ENTPs simply become bored far too easily to live their lives always seeking out balance and harmony. For them it is more valuable to dive into something and go all out with it. ENTPs dislike doing anything halfway and often feel like it is a pointless approach. They want to learn everything they can about a subject, which often means immersing themselves completely. ISTJs do believe in creating balance in their lives, simply because they enjoy dependability. When the ISTJ has a clear path in front of them it truly helps them feel at easy and prepared for what’s to come. ISTJs dislike too much chaos, and also become annoyed with people who are overly intense. They do enjoy balance and often believe that creating this type of stability in their lives is beneficial in many ways. ESTJs definitely believe in trying to achieve some sort of balance in their lives. They strive for maintaining stability so that they can be sure their responsibilities are taken care of. ESTJs also enjoy balancing their work ethic, with their relaxation time. They know how to live their lives with balance, and often work hard to maintain this when they can. ESTJs can become high strung at times though, which can make it more difficult for them when they cannot achieve the balance they seek. Balance is definitely important for the ISFJ, since they believe in creating a sense of harmony in their environment. Anything too extreme can definitely hinder the peace around them, so the ISFJ often enjoy balancing when they can. They want to be able to live their lives without going to drastically one way, but sometimes this can be challenging for them. ISFJs can be afraid to step outside of their comfort zone at times, and might live their lives without exploring certain things that would create more balance in their lives. ESFJs do enjoy maintaining balance in their lives, especially since they are often juggling so many things at once. They strive to take care of their loved ones and work hard to make sure their lives are stable. ESFJs often enjoy having a balance of work and relaxation as well, since they enjoy being able to experience fun and exciting things with their loved ones. ESFJs are always working to manufacture this balance, which can definitely be hard for them to maintain. For the ISTP it is more important to live their lives with independence than with balance. They might try to achieve balance and stability in some areas of their lives, but they don’t need things to be perfect. ISTPs often jump from one experience to the next, simply because they live so much in the present. Their lives aren’t always balanced, but they do strive to live with passion and to learn from their experiences. ESTPs aren’t always great at balancing their lives, and often can be a bit intense with things. They can even become obsessive over certain things in their lives, making it nearly impossible to truly achieve balance. ESTPs are passionate people who dislike allowing anything to hold them back. They live in the present and want to soak up the world around them without feeling stuck in the same place. ISFPs do often believe in acquiring balance in their lives, but this isn’t always an easy accomplishment for them. They are passionate people who make their choices based on their emotions in the present moment. This can make it difficult for them to be balanced, since their choices can sometimes take them down different and sometimes intense paths. ISFPs want to enjoy their lives but they also want to make decisions that are moral and good. ESFPs don’t often strive for balance in their lives, instead they seek out excitement. They enjoy living in the present moment and want to live every moment with passion. ESFPs hate remaining stagnant for too long, and because of this they are always seeking out new experiences. They want to enjoy life, and are more interested in being happy than simply achieving some sort of momentary balance which likely will cause them stress to maintain.